In Take me out of the bathtub and other silly dilly songs* Alan Katz uses common children's songs to make new, funny songs. but rewriting the lyrics can be a challenge. For Take Me out of the Bathtub!, Katz uses the melody from Take Me out to the Ballgame. Take me out of the suds. I feel so sudsy and wrinkle-y, too." A fun song can be a great tool for remembering facts you need to memorize. I'll bet you can sing close to 50 songs off by heart. The same "easy to recall" idea can help you be a stronger student. 1. Select a well known children's song. 2. 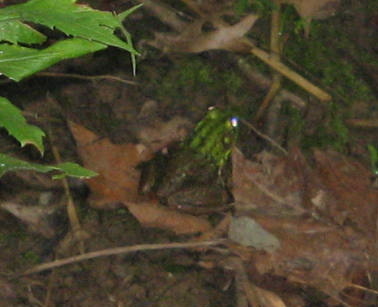 Gather the facts about frogs and/or wetlands. 3. Write the new lyrics. Be careful to preserve the structure and rhythm of the original song. Extra Challenge - Make an online book in a web site to share your creation with your school or community. Each web page can be one line of the lyrics. Link the pages in order to allow an easy read through. Make an Main title page that includes credits and a linked start here. Make your own illustrations using a computer or use free web images to add pictures. Alternatively, you can scan in hand drawn art. By the way - You could also try this idea for other subjects like: oceans and continents, planets and heavenly bodies in the solar system, geometric figures or elements of the periodic table. For a real challenge make a song that helps you remember the parts of the cell! Save a tree - use a digital answer format - Highlight the text. Copy it. Paste it in a word processing document. Save the document in your folder. Answer on the word processing document. Save frequently. Make Your Own Printed answer sheet.